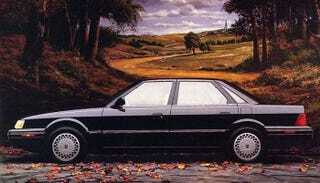 What Car Do You Never See On The Road Anymore? People who hang out with me are often surprised when I look past something like a Ferrari 458 to the mint Pontiac Fiero behind it but, like most car enthusiasts, I prize a unicorn over stallion. What car do you never see on the road anymore that you'd love to see in person? Sterling – a sort of weird Rover/Honda tie up – was a luxury marque launched in the United States with a blend of classic British styling, Japanese engineering, and poor English build quality. The cars were actually a bit of a hit in the United States at first, but eventually the reputation (and a strong English currency) caught up with them. Despite selling north of 30,000 cars in the United States, I'm fairly sure most of us haven't seen one in the last five years.